Home/College Life/Why consider attending a Trade School in Miami? Learning a trade can be more rewarding and get you up to speed faster than any college degree can. If you think a 4-year degree is going to prepare you for the workforce, think again. A 4-year degree can do a lot for you, what it is best at is saddling you with crushing debt that will take most of your life to pay off. And that’s just the undergraduate route. Consider that many people coming out of medical school (and that is at least 8 more years of intense study) are in such a state of debt that they must live like paupers. As one recent Medical School Graduate lamented, her friend making $200,000 per year had so much debt that she had to move back in with her family. Don’t dismiss trade school. Learning a trade can be more rewarding and get you up to speed faster than any college degree can. Well, unless you get into Harvard, Yale, MIT, or Princeton then forget everything you read here and go, go, go! But rest assured, a lot of graduates from those schools will wish they had a technical degree instead. Alright, for the rest of us one of the most rewarding things we can do is to build something with our own hands. It can be a work of art, a house, and engine or anything g you can imagine. Don’t laugh at the art comment – think of those folks on TV who fix up old cars or create custom motorcycles. What you are watching there is hands on skills that can only be taught by doing. Burying your nose in a book won’t make you a master welder, electrician or diesel mechanic. And these are high skill, high paying jobs that you can start directly out of trade school. Trade Schools in Miami are filling the Skill Gap. Think about it. Unlike people who have graduated with degrees in English Literature, Philosophy or Underwater Basket Weaving, you won’t have to work at McDonald’s. The trades will always be in demand. In fact, there is a tremendous demand for technical skills all around the country, including right here in Miami. The gap between the demand for these skills and the people who have these skills is so great that anyone who steps up could immediately find a job in a rewarding respected profession. One technical/vocational school in Miami is dedicated to addressing the alarming problem of this skills gap. And what’s more, CBT College is passionate about helping their students succeed. No matter what your area of interest, CBT has a program that is right for you. A degree from CBT is just the beginning of your growth in an exciting and in demand career. CBT students and graduates have found CBT to be supportive, challenging and rewarding. 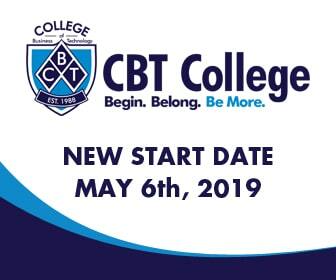 To learn more about the course offerings at CBT, go to our website or download our list of available course offerings.